Sue Wallis STATE CONGRESS WOMEN ? • Organizing a focused lobbying effort to re-open horse slaughter plants in the U.S. They are targeting Appropriations in the coming weeks to re-initiate funding for inspections of horse slaughter plants. • Actively expanding their coalition by seeking partnerships with other industries, including the Oil and Gas lobbies. • Deceptively focusing on horse welfare as the justification for reinstating horse slaughter, in an effort to counter public opinion, which is strongly against commercial horse slaughter. • Actively seeking markets for horse meat exports in China and Russia. • Shifting the focus away from mustangs on BLM lands toward domestic horses and horses on Tribal lands, including mustangs. The shift appears related to BLM director Bob Abbey’s reiteration of the Administration’s position that slaughter is not an option for federally-protected wild horses. While slaughter proponents have been organizing ever since the plants closed in 2007, Sue Wallis announced at the end of the conference that they were building their lobbying coalition now, “in the next few days.” Although in the past they have been dismissed, this year it appears that pro-slaughter proponents are becoming more organized and, with the new Congress, could pose a greater threat to the protection of American horses than ever before. Given that wild horses on tribal lands and some BLM horses do go to slaughter, this is an issue that we will closely watching and involved with. We will keep you apprised of any developments. Dispatch #1 from Las Vegas . . . Approximately 60-70 people were in attendance for this informal opening that featured Trent Loos, rancher and radio host, along with conference organizers Sue Wallis and Dave Duquette. Loos began his remarks with a description of his “in the trenches” work fighting against the humane farming initiative, Prop 2 in California and why we need gestation crates for pigs and cages for chickens. He said that “our challenge” is to “speak in a language that everyone can understand” and bridge the gap between resource provider and consumer. Loos said that on his trip out to Las Vegas, he asked ten people what they thought of horses being slaughtered for food and nine out of ten opposed it, believing that horses should be treated differently than livestock. For Loos this highlighted the challenge they face and they need to find a new way to talk about death and the benefits for the horses. Then Loos gave a brief history of how few people show up to support slaughtering horses in the United States, recalling a protest in Illinois which he thought 200 people would attend, but only five showed up. He said the reception crowd was “the biggest crowd in ten years,” and gave credit to Sue Wallis. Loos concluded by saying that the fight would be won one person at a time and said that if you weren’t getting death threats, you weren’t doing enough. Sue Wallis took the mike and stated that United Horsemen was the grassiest of grassroots. “We have no money. No one in the horse business or ranching business has any money.” They went on to announce the winner of the Dodge Truck giveaway, claiming that the raffle didn’t make any money either. She said that their whole effort was done out of sheer passion. Some poetry reading and music followed before Sue opened the mike to the audience and Bennie “Blue Thunder” LeBeau from the Eastern Shoshone went up to speak. He talked about horses representing freedom and the Eastern Shoshone are speaking up for Mother Nature and the Web of Life. He talked about Chief Seattle and how he relied on the sacredness of horses. Then he sang an honor song. We look forward to hearing more from Blue Thunder in the coming days. 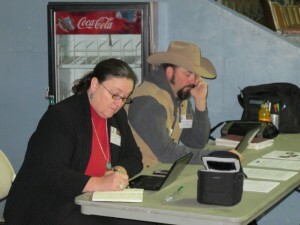 Among the groups with information tables in the room were: Fairlea Ranch, which appears to be a horse breeding facility; Nevada People for Animal Welfare (NvPAW), an anti animal rights group with anti-HSUS and anti-PETA literature; the Eastern Nevada Landscape Coalition, which had information on noxious weeds; the newly–formed Guardians of Oregon’s Wild Horses, which is supportive of the roundups and is focusing on one Herd Management Area in Oregon; and a land conservation district from Colorado. There were 150 to 200 people in attendance for the first full day of the conference. The three highlights of the day were the keynote by former Congressman and current lobbyist Charlie Stenholm, a talk by BLM director Bob Abbey, and several presentations by representatives of various Native American tribes. Charlie Stenholm began the day with a speech that laid out an aggressive lobbying strategy. He acknowledged that “It’s not easy to be a spokesperson” for the horse slaughter industry, but nevertheless, optimistically predicted that the barriers to opening U.S. slaughter plants will be removed by the new Congress. Stenholm highlighted that the GAO report on the effects of the closure of U.S. horse slaughter plants on horse welfare, due out soon, will play an important role in the Congress’ decision on this issue, noting that it was likely that the report will result in a call for hearings. He urged conference participants to testify at the hearing to carry the message that there are too many horses and commercial slaughter must resume in the United States. Like the other slaughter proponents, Stenholm repeatedly invoked the welfare of the horses as a top priority. However, his true motivations were revealed at the end of his speech, when, in answer to the question he sated that his goal is to restore “the salvage value of the product,” the horse being the product. BLM director Bob Abbey followed with an afternoon speech that was generally positive for wild horses and certainly not what slaughter proponents wanted to hear. Abbey reaffirmed the place of the American wild horse on our public lands as part of our national heritage and reiterated that “slaughter is not an option for America’s wild horses.” He stated that the program needed to shift toward on-the-range management as the continuing to maintain horses in holding facilities was not sustainable. Abbey stated that he had met and talked with Madeleine Pickens about her eco-sanctuary plan and believed her idea has merit and deserves serious consideration. He also stressed that BLM was interested in public involvement in monitoring herds and other public/private partnerships. Karen Sussman, director of the International Society for the Protection of Mustangs and Burros, told us after that it was the most positive speech for wild horses that she had ever heard a BLM official give in her 30 years of advocacy work. On the less positive side, Abbey highlighted the Office of Inspector General Report and the so-called independent observer report that concluded BLM’s roundups were humane. He defended both reports which were criticized as being biased and white washes. It was good to hear the administration stand by its position that killing healthy wild horses or selling them for slaughter were not viable options. His entire speech can be read online. Following Abbey was a series of speakers, the most notable of which were representatives of five tribes – Yakama Nations, Umatilla, Warm Springs Tribe, Shoshone-Bannock, Coleville – organized under the National Tribal Horse Coalition. Three of the tribes had representatives speak today, along with a representative from the Navajo nation. The tribes spoke about the wild horses in language that ranchers traditionally use. One tribal representative went as far as to blame the wild horses for their “gang” and “youth drug” problems. The Yakama nation claims to have 15,000 wild horses on their lands. The tribe is interested in opening a slaughter plant. The tribes seem to have a contradictory message, stating both that horses are revered in their culture, yet advocating for their mass slaughter. The tribes blamed the “total collapse of the ecosystem on our homelands” on wild horses, ignoring the cattle and other destructive forces at play. The tribes echoed Congressman Stenholm’s call to inform Congress of their position. Tomorrow we will hear from Temple Grandin among others. Today’s attendance ranged between 120-150. The morning was dedicated to anti-animal rights rhetoric. HSUS was the primary target and the presenters included a retired military intelligence officer (Dennis Foster) who goes around the world making presentations about the threat to industry by animal rights activists. Mr. Foster warned, “They are after our children and they are winning.” Whereas, on Tuesday, “compromise” was not a four letter word, according to former Congressman and current lobbyist Charlie Stenholm, today Foster said that compromise was not the answer. “They start with nothing, you give them something, they get everything,” he said. Mindy Patterson went on at length complaining about HSUS’s ability to pass Prop B, the puppy mill regulation initiative and talked about legislative efforts to overturn it. She said that early polling showed the initiative passing by a large margin, but it won by just a small margin, largely due to the Tea Party movement. “The Tea Party movement made a huge difference with voter turnout. They understood that Prop B was an infringement on their property rights.” She highlighted that the urban areas vote for animal welfare issues, a phenomenon happening in all the states. She encouraged people to stand up for agriculture and get to know their legislators. Karen Falen who is the daughter-in-law of John Falen, president of the Public Lands Council, is an attorney who spent a far too much time outlining how environmental groups file litigation over environmental laws and then collect big attorneys fees from the government. She ended by encouraging ranchers and others to file legal petitions to challenge any regulations they didn’t like. Temple Grandin was next. She began her talk by relaying all the alternatives to slaughter provided people who asked her not to attend the conference. She was the only presenter to even mention alternative solutions to slaughter. Solutions included low cost gelding, surcharges for registering to cover euthanasia, hay banks, support for in place rescue, etc. Temple stated that her biggest concern with regard to this issue is stopping horses from being shipped to Mexican slaughter plants, which are a horse’s “worst nightmare.” She cited numbers that showed the number of horses going to Mexico increased after the U.S. slaughter plants closed. On the farm: body condition, lameness, dirty animals, coat condition, etc. At the slaughter plant: went down on the first shot, prodded with electric prod, vocalize, slip or all, etc. She mentioned that she thought BLM should implement a welfare measurement system for their mustang operation and had sent the agency recommendations 10 years ago. She emphasized that all aspects needed to be video monitored. Grandin said that there are 2 EU slaughter plants in Mexico that are regulated. The municipal plants get inspected once a week by a Mexican meat inspector, but they don’t check on treatment of horses. The village abattoirs are the worst. She said that the Canadian plants are handled well – they shoot the horses. After Temple, a representative of the American Humane Association delivered essentially a sales pitch about what their certification program could do for the horsemeat industry, touting what it had done previously for other meat industries. This is the same organization that certifies the treatment of animals on movie sets. The next speaker was the aptly named Ed Butcher, a retired Montana State Senator who was the prime sponsor legislation in Montana to restore horse processing. The bill includes a requirement that anyone suing over a slaughter plant in Montana would be required to post a bond (15 percent of the annual income of the plant) and if the case is lost, pay all defense legal costs and lost revenues. This legislation makes legal challenge virtually impossible. “Restoring the ability to salvage a horse is critical to salvaging the American horse industry,” Butcher said. Butcher moved on to his strategy for locating plants, identifying states with “business friendly” judiciaries, and keeping operations small (100 horses per day) to avoid union problems and interstate regulations. He suggested that taxpayers industry, not taxpayers should pay for inspections, which should be overseen by the state instead of the federal government. He did not reconcile this position with his Chinese market idea, which would require federal involvement for the export of horse meat. He ended by urging participants to meet with their legislators and ended by setting a goal of horses going to a “processing” facility in the U.S. by next year. Jason Smith of Warm Springs Tribe spoke next, indicating that the National Tribal Horse Council has asked the Bureau of Indian Affairs to conduct a feasibility study for a slaughter plant on reservation land in the Northwest. Perhaps in response to Bob Abbey’s unequivocal rejection of slaughter of America’s wild horses, Wallis now indicated that her focus was excess unwanted domestic horses. 1. Legislation – to ensure humane processing of all classes of livestock. 2. United front by “animal welfare” [pro-slaughter] organizations to support the legislation. 3. Support for groups addressing the humane treatment of animals from birth to death. 5. Combined offensive and defensive strategy to win in the court of public opinion. “We have to win the hearts and minds of the American public,” Wallis said. 2. Facilities for evaluating horses for potential use. 3. Facilities for mares and foals to be put out to pasture. 4. Slaughter facilities for horses that are past their useful age – unsound, dangerous, old etc. At the beginning of her speech, Wallis stated that building a state of the art slaughter facility of the type Temple Grandin would approve would take 1.5 to 2 years, which was “too long: since we need many plants across the country”. But at the end of her speech she contradicted herself by stating that any “processing system” would be designed and approved by people like Temple Grandin and American Humane. A Mexican breeder said that he was lucky to get 5 good jumping horses out of every 20 bred, and indicated his interest in maintaining slaughter as a disposal option. He talked about the NCA’s bottom line opposition to outside groups coming in and telling the cattlemen how to run their business and treat their animals/property. Alexander told the audience that it was important to have a professional lobbyist in Washington, and talked about how they actively worked against HR 503 (Protection of Equines) and HR 305 (humane transport bill) last year. • Defend the right of the horse owner to ethically dispose of horses. Alexander concluded his talk by stating the importance of developing markets for horse meat and noted that the market demand for cattle products in Asia is mostly for offal – heart, tongue, intestines, etc. In his speech Alexander had said that he was in favor of a laissez faire approach by government to business, so Deniz asked during the Q&A period how he reconciled that position with all the government subsidies that agriculture receives, especially bargain basement grazing rates on public lands. Alexander responded that he didn’t know anything about that issue (!). Another public lands rancher responded by saying that when you look at the rate for grazing on public lands, you have to take into consideration all the money ranchers put into the public lands – water, fencing, managing their cattle, that it’s equivalent to private grazing rates (which in Nevada are $25 per AUM vs. $1.25 an AUM on public lands). He claims that when you pay to graze cattle on private land, the private land owners take care of everything – water, fencing, herding and handling the cattle, etc. (We do not think this is actually the case.) He said that the taxpayers actually benefit by public lands grazing because the ranchers are helping to take care of and steward the public lands. Note: In reality, the Congressional Research Service found that taxpayers subsidize public grazing to the tune of AT LEAST $57 million annually, and noted that the Center for Biological Diversity places the actually cost to taxpayers for ranchers grazing on public lands at $500 million a year. Gary Moyer, a representative of a Colorado conservation district spoke and highlighted his belief that BLM should not be allowed to leave horses in excess of AML on the range. Moyer, a rancher, noted that he and his friend Wade Cox, also a rancher, decided a few years ago to get involved with the conservation districts. From what Mr. Moyer said, it is apparent that these these districts are dominated by ranching interests. He mentioned the lawsuit against the zeroing out of wild horses in West Douglas and noted that his conservation district was hoping to intervene in the case. He urged participants to let their elected officials know that they support the removal of excess wild horses by BLM. Joey Astling, USDA/APHIS Slaughter Horse Transport Program then stated that he does not monitor whether BLM horses are crossing the border – that’s up to the state brand inspectors. “I don’t know of any brand inspection going into Canada and Mexico,” he said. After the meeting concluded, Suzanne asked Bill desBarres about the mustangs. He said that “lots of BLM horses” were being processed at slaughter plants in Canada and he had no idea where they were coming from. He told me that the only thing required currently is a piece of paper regarding the horse’s exposure to chemicals or pharmaceuticals such as bute. If they have been exposed within the last 180 days, they are sent to a feedlot or sent for “processing” for non-human consumption. If they have not been exposed, they can go straight to the slaughter house for human consumption. Mr. desBarres stated that new EU rules will change this situation, and that is why they are coming up with a “lot permit” system, that will allow for loads of horses to be slaughtered without requirements for individual identification of horses. Mr. desBarres said that this could help the U.S with the excess wild horse problem. The day closed with G.B. Oliver of the Paragon Foundation, who talked about property rights and the Constitution. He urged participants to challenge the standing of environmental groups and animal rights groups to file lawsuits based on lack of actual damages suffered, and noted that Paragon has successfully intervened and prevailed in five legal cases on these grounds. Sue Wallis closed by noting her plans to create a broad based coalition to move forward in the interest of horses and horse people. They ended with a mention that the Appropriations process for 2012 will begin in February and they plan to get in there from the start to reinstate funding for federal inspections of horse slaughter plants.